By my count, 18 people have achieved that most revered of arbitrary designations: the EGOT (Emmy, Grammy, Oscar, Tony). It’s like the Triple Crown, if the winners also had to sing and dance. That number, 18, is only accurate if you include people who’ve won honorary awards—lifetime achievement, humanitarian, honorary and the like. If you knock out all those people (sorry, Barbra), the number drops to 12. 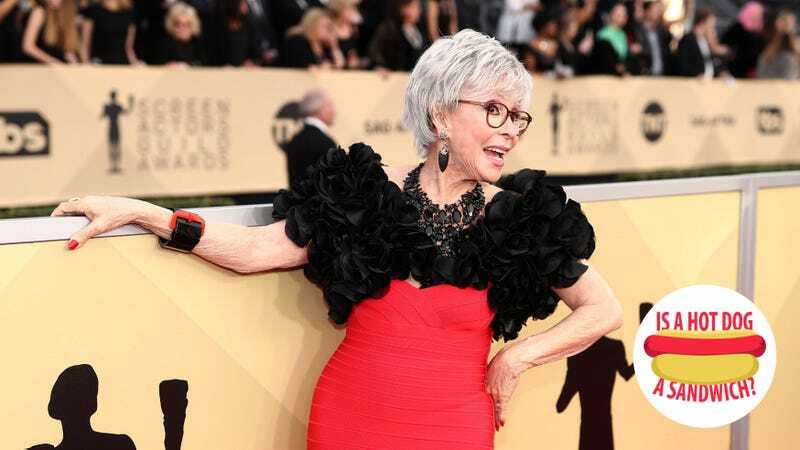 One of those 12 is Rita freakin’ Moreno, who is currently giving one of the funniest, most heartfelt, and generally best performances on television as Lydia on Netflix’s exceptional sitcom One Day At A Time. Moreno, who will receive a Lifetime Achievement Award from the Television Critics Association at the organization’s annual awards ceremony this weekend, is a living legend. She is a world-class artist and a once-in-a-generation talent. She can do no wrong. And she has now weighed in on the great hot dog debate. TO: What makes it a sandwich? RM: It’s a sandwich! Anything that’s between two slices of bread is called a sandwich. Why is that a question? Why is that a difficult issue? Does anyone say otherwise? TO: Actually, lots of people say no. They say hot dogs are their own thing, in their own food taxonomy. RM: No. No. Bread, and bread, and meat in between. That’s a sandwich! It’s a sandwich. Starring Moreno, Justina Machado, and other talents, One Day At A Time returns in 2019. In the meantime, you can stream two delightful seasons on Netflix. You’re welcome in advance. Hey Trombone Shorty, is a hot dog a sandwich?